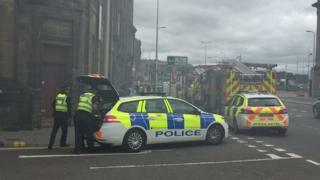 A fire in a derelict building in Dundee city centre has caused significant traffic disruption. Firefighters began tackling the blaze on the ground and first floors of the building in Dock Street shortly before 12:30. The incident led to the closure of one eastbound lane, resulting in traffic backing up the entire length of the Tay Road Bridge's northbound carriageway. The fire has been extinguished but crews remained at the scene. A Scottish Fire and Rescue spokeswoman said a structural engineer has assessed the building as unsafe.